Henrik Sedin (born September 26, 1980) is a Swedish professional ice hockey centre and captain of the Vancouver Canucks of the NHL. 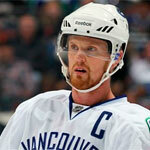 His identical twin brother Daniel also plays for the Canucks. Having played together throughout their careers, the pair are known for their effectiveness playing off one another. Henrik, a skilled passer, is known as the playmaker, while Daniel is known as the goal-scorer. 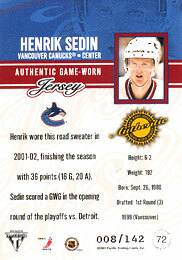 Selected third overall by the Canucks in the 1999 NHL Entry Draft, Henrik Sedin has spent his entire NHL career in Vancouver and has led the team in scoring from the 2007–08 season to 2009–10. In 2009–10, he won the Hart Memorial and Art Ross Trophies as the NHL's most valuable player and leading point-scorer, respectively. 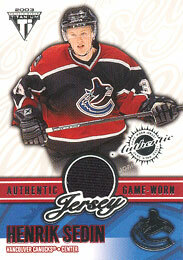 He was additionally named to the 2010 NHL First All-Star Team.